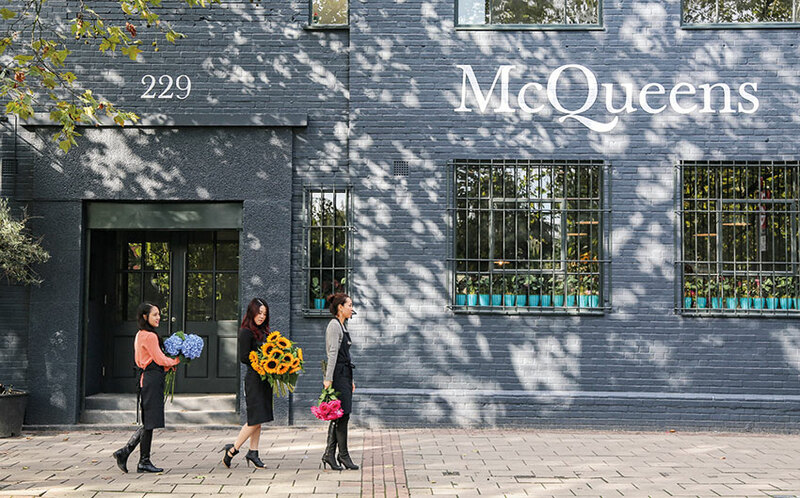 Kally Ellis is the founder and owner of McQueens, which is London’s most sought-after florist agency. 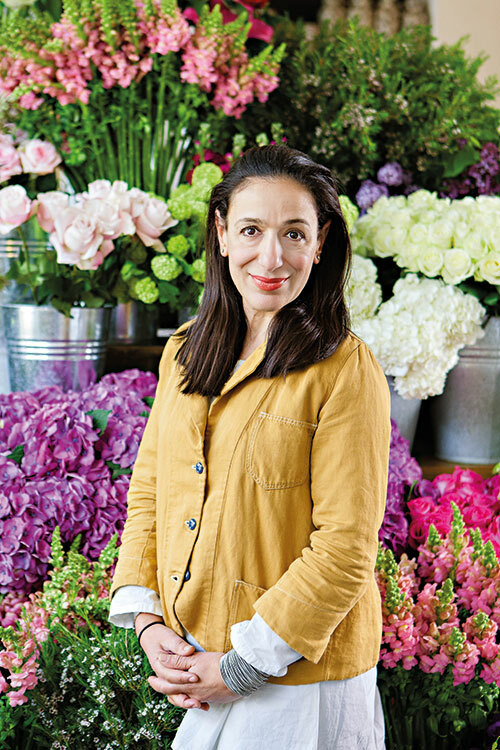 She set it up in 1991, and it has since grown from a small shop in Shoreditch into the mini empire it is today; with a massive store and an always fully-booked flower school (with students from all over the world), her company has won many laurels. Her clientele includes the top hotels in London, clients in television and film, and private clients from as far as Japan, apart from being the exclusive florist for the Vanity Fair Oscar Party in Los Angeles for the past two decades. Ellis is one of the most impressive women you will meet with a refined eye for beauty, along with a core of steel. Single-handedly building her business from the ground up, she has turned a small local flower shop into a force to reckon with. Sitting down with her in her exquisite shop surrounded by lush flowers, as teams of people rushed back and forth while vans emblazoned with the classic McQueens logo loaded and unloaded bouquets, I felt like I was being treated to a backstage peek into another beautiful world. My life before flowers was very different. I studied languages at university and ended up working in the marketing department of a French bank in London. It really wasn’t me — smart suits and Hermès scarves — I knew I needed to do something much more creative. It was while visiting a friend in Paris that I started to think about flowers; the bouquets you could buy there were beautiful and a world away from what was being sold in the UK. Shortly after I returned, I had a dream one night that I had my own flower shop. I knew then what I had to do…. At the beginning, it’s all a question of organisation and logistics. We started small to keep our costs low and as we grew bigger, I brought in experts like accountants and technology consultants. I believe in focusing on the areas that you do best. Flowers are perishable goods, so you have to learn how to buy sensibly, rotate your stock and keep a tight rein on costs. Honestly, I wouldn’t change a thing. Not because I think I did it all perfectly, but because I truly believe the best way to learn is by making mistakes, especially in a creative industry. Learn to admit you’re wrong, move on. We pride ourselves on a very high standard of service to our clients, and after 27 years in the business, that is the keystone to our reputation. Our philosophy is simple; it’s to enhance the natural beauty of the flowers. 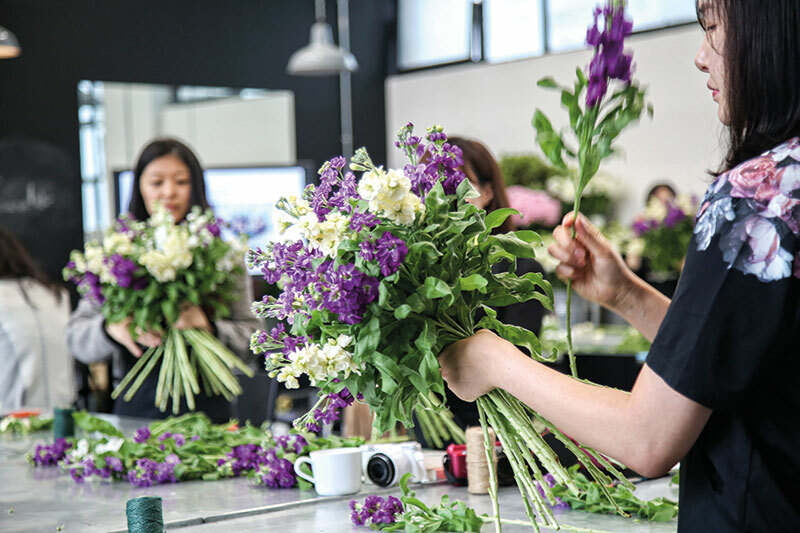 Nowadays, floristry is a form of fine art. Look at the installations we create in London’s finest hotels and you’ll see that there is a purity in our work that complements the flowers, rather than detracts from them. Nature has done a wonderful job with flowers; who are we to mess with that? What is the part of your day that you most look forward to? I enjoy meeting clients and interpreting their briefs to create some wonderful installations in London and all over the world. Our customers grow to trust us and give us free rein to express our creativity but that’s not something that happens overnight. Building up that sense of trust, loyalty and friendship is a part of the business I particularly enjoy. I also work with a team of highly talented creative individuals for whom I have nothing but respect. It’s a tough industry. It involves early starts, long days, often working in wet, unheated conditions. To maintain your creative energy and stamina isn’t easy but being part of a team that thrives on excellence and imagination certainly helps. My mother. My love of flowers came from her — she could grow anything in her garden. She originally came from Cyprus and moved to the UK as a teenager, but she tried to create a touch of Mediterranean paradise in her own garden. Growing things is an act of love, and that’s why flowers are so important on those special occasions in our lives — births, marriages, even deaths. They don’t last forever, but for those moments when they are in full bloom, they give us a glimpse of perfection, and lift our spirits. Just like my mother. I love walking around the city and Hampstead Heath is my favourite park in London. It’s just a couple of miles from central London but when you’re there it feels like being in the countryside. It’s such a peaceful and therapeutic place. Eat at tapas bar Morito, the ‘son’ of Moro in Exmouth Market. They’ve just opened a larger restaurant in Hackney — not far from our McQueens HQ — so I’m very pleased about that.